Grand Pacific returns to Spokane Gun Club « Shoot P.I.T.A. 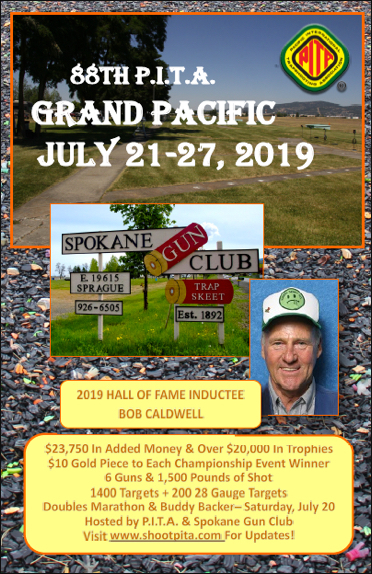 PITA is excited to announce the 2019 Grand Pacific tournament will he held July 21-27 at Spokane Gun Club, WA. (2/24/19): RV email invoices have been sent to 2018 attendees with payment due Feb. 28 to confirm the space. If you have not sent your payment please do so now. If you did not receive the email let Sue know immediately. We have a small waiting list for 30 amp spaces so if you have not reserved but would like to get on the list for a space email or call. There are still 20 amp spaces available if you would like one of these. (2/5/19) If you had a space last year and want it again this year email Sue immediately. 2018 attendees wishing the same space will be given preference but will need to confirm/pay no later than February 28 so if you attended in 2018 email today and you will receive an email with all the details, including payment instruction, watch your inbox. If you did not have a space in 2018 or wish to change space email your request (sue@shootpita.com) and it will be confirmed as space allows. The front row (20 amp) area has opening – reserve now. OXFORD SUITES offering special room rates. This newly remodeled hotel is once again offering special rates for shooters attending the Grand Pacific. There are a limited number of room with the special rates so reserve early. Mention the code PITA when reserving. Call 509-847-1000 today to reserve your room. Watch our website for further details including golf cart rental.